Go HERE for the "Inking Pink" blog hop & a giveaway! Go HERE to participate in the "Polka Dot" Imagine Nation Challenge! Good Morning My Creative Friends! WOW, can I just say that I THINK I have a NEW FAVORITE tool!! Crikits.com sent me an Embosser Kit to try out & I LOVE LOVE LOVE IT!! For my tutorial, I decided to emboss & cut out my Favorite flower, a Rose! I decided to showcase it onto a black textured cardstock 3x3 card! I decided to keep it simple only because I did not want to take away from my "Beautiful" Rose! ;) I hope you enjoy my video showing you how to use this AWESOME product! That was incredible, my mind is spinning with all the things that you can make with this embossing kit!! Thank you so much for showing this to us!!! I Love It, and can't wit to try it!! I forgot to say what I wou;d use this embossing kit for, and I guess I wuld use it for making cards, I thiunk that It would add such beautiful dimention to everything that you nake!! How pretty! I envision making candy box Valentines. I was panicking during your video, thinking you had forgot to switch out the embossing tip for the blade ~ lol- but you did it! great job - super pretty card! Very nice card love the embossing! OMG, I can't beleive your giving away such a great gift!!! I would love to have it! I would use it to emboss accents for cards. I think there is endless things you could do with the embossing tools in the circut.The thought of christmas cards with embossing is endless.thank you for a chance to win. The possibilities are endless as to what you could do with this embossing kit. What an awesome giveaway! Love the card. Love the rose! This woould be nice to win. Add a little something extra to every project. I'd use it to jazz up cards. Love the card you made. I think I like how easy it would be to emboss. I would use this kit in my card making. I love love to make cards and i always use plain paper and often I wish I can to add something extra to my cards. So I can see a lot of improvement in my skills with this amazing kit. WOW! What a neat project. I would love to try making your flower. This looks beautiful. I would love to make some lovely embossed snowflakes for holiday cards. Wow! That turned out so pretty! I would love one of these sets because my sister is getting married next fall and I'm doing het wedding invitations. How pretty would they be with an embossed image like that rose!?! It's the first time I've seen the embossing tool used. Your rose turned out amazing. I would love to try it!! I would love to try this out and emboss the bases of cards. I'm so excited to see this in action. I wanted one but didn't know how well it would turn out. Beautiful card as always. OOOooo, can you just imagine the Christmas cards you can make w/ this? I LOVE embossing projects, so this will probably go on my wish list. Wow Emma, that embossed rose on your card really POPS!!!. I would love to have a Crikits Embossing Kit of my own for sure. I just love the texture that the embossing kit adds to your project, and the possibilities are endless of all fun things I could with this kit.. Thanks for the awesome chance to win.. This is beautiful! I think I would use this for cards and layouts. I can see beautiful Christmas ornaments with this. What an awesome concept! I knew about the pens, but had not heard about the embossing kits. I can see lots of cards being made with these in the future. If I don't win, it will be on my Christmas "Wish List". ;) Thanks for the opportunity. P.S. I got your dvd in and loved it!!! Great job. Emma I love your rose it is so pretty. There are so many things you could make with this. Talk about some beautiful cards! If I won this I would use it to make my Christmas cards and to add a little something to my scrapbook pages. Thanks for the chance to win, I hope I win!!! Oh I love it Emma. I've been eying those for awhile, but this is the first time I've seen them demoed. They should be very helpful with making Christmas cards. I can see them being used to add a bit of glitz on most anything. Thanks for the demo. Like you said, there are a million things you could make with them They are very cool. Thanks for the chance to win. Love your video's, you make using the gypsy look so easy. Love your card/rose. Simple yet so beautiful! I would use it to make hearts, words and jazz up my cards with it. The possibilities are endless. I have a set of the Crikit pens and would love to win this embosser. TFS and the chance to win! I love this idea. I am thinking of a beautiful border of fall leaves for a scrap page or a stocking for Christmas. My mind is going crazy thinking about the possibilities! Great job once again Emma. I'd love to have that embossing kit to maybe put together some license plate cards for men/boys. That is so neat! I love the card! I would use it for both cards and layouts! Thanks for such a great opportunity to win! WOW!! I love this!! My mind in just racing with all the things I can do with it for christmas!!! Thanks for the chance to win!!! Love your card!! I will use Crikits Embossing on my Christmas 3D Projects!! Thank Emma I love your work!! So very cool. I was just thinking the other day if only my cricut could emboss. Had no idea these were out there. I think I could use these in several things for my christmas cards, snowflakes, stars, ornaments oh the possibilities are endless. I love embossing I have always done it by hand and that takes a very long time so this would be incredible. wow - that is so different. I haven't done anything like that. I would start with lettering a title to the max....and then go on to some flowers after that. endless possibilities. I love it Emma!!!! What a great new product!!! I would definitely use it for all kinds of cards!! It adds a special WOW factor to your project! Thanks for sharing this with all of us...I have always wanted to see the embossing tools and how they work. The rose was perfect...I think I would try some Christmas trees with that beautiful green you showed. Thanks for the chance to win!! I love that this is so easy to use with the Cricut. I'd love to try it on metal...embossed metal pieces look terrific on scrapbook pages. Wow, what an amazing product! Thanks for keeping us up with all the latest tools and techniques. I love it! This would be great to have to be able to add a little extra to all my cards!! Thanks again. Awesome! I love the colors that come with the kit-I would make some ornaments for Christmas cards! Love the rose-how pretty!! I love that rose!! I can think of zillions of things I could do with that. Wouldn't it be so cute to make a Santa and emboss his beard LOL. Thanks for the chance to win Miss Emma. I had not seen this tool in action and I think it is amazing. I have resisted the Nestibilities fad but know I can see by using my Gypsy and this embossing kit that my imagination is the only limitation. Loved your video, very well done. The ros is really beautiful! Love it. I think I would use it more for my scrapbook pages. With the holiday coming, they will add lots of interest to my pages. Thanks for the awesome giveaway. Just realize i didn't leave my contact info. The rose is really beautiful! Love it. I think I would use it more for my scrapbook pages. With the holiday coming, they will add lots of interest to my pages. Thanks for the awesome giveaway. This looks like a lot of fun. I love it because of the detail it brings to the project. I would use it for all sorts of embellishments, like snowflakes and such. Thanks for a chance to win. How beautiful your rose turned out. So many things you could use this for... I would make some beautiful cards, add something special to a scrap book layout... wow.. how exciting. OMG. This is the second time I've see a project with the embossing kit. I'd love to have one! I love the way you can use one of your cart images to emboss. I could make so many cute cards with it. TFS. I love the way the embossing looks, your card is beautiful. I would use it to make my cards more creative. Your card is beautiful! I love how people emboss like this and I've always wanted to try it! I would use it for some cards and definitely for my layouts! It would add such cool effects! I love your rose it turned out so pretty, I love thier pens, Would love to have the embosser kit. Love how the red pops off the page- I am not sure what to make I think I would have to watch some more videos, and gleem some of your great ideas! I would love to use this to emboss/cut ornaments and stars for Christmas cards!!! Beautiful card! I love the idea of embossing with my cricut. I would try making some christmas decorations for christmas seeing that it is coming up soon. TFS! This is super cute. I would definately be using that for Christmas, it would be cute to do a present and then use that as the bow as bows are usually shiny. Thanks for sharing Emma. This is a cool project. I would make monograms for my first project. I love your rose it turn out great. 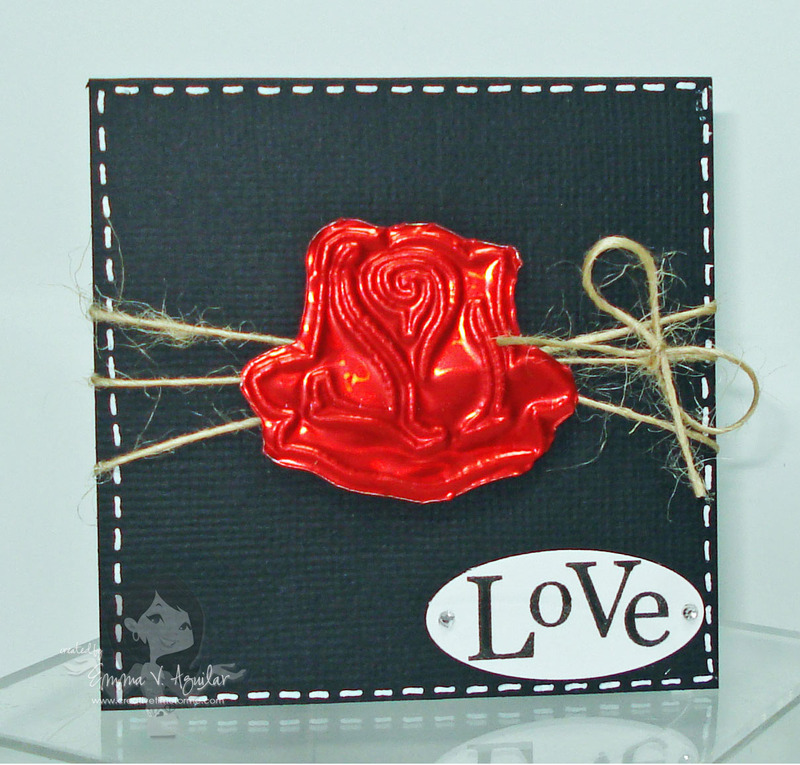 Love your embossed rose. If I had this embossing set I would find all kinds of projects to use it on, as to what I would do it now I can't think, maybe a rose. Thanks for sharing your fun and beautiful projects. This look like a lot of fun. I think for Christmas these would make some great card idea like Xmass tree, ornaments. So fun. Thanks for sharing Emma you always make great projects. Thanks so much for sharing another great product from Kricuts! This looks like fun and the foil colors are beautiful! Christmas tree decorations and gift tags are rolling around in my head with this product. 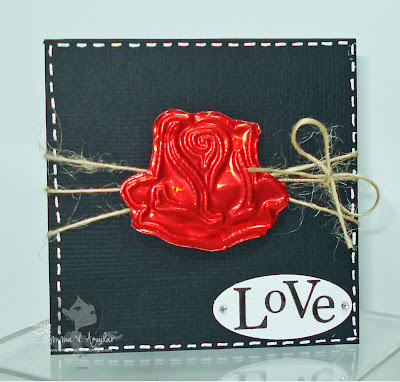 Love, Love, Love, the Embossing video and your blog! Thanks for the chance to win. I would love to win it and make Christmas cards with it. Wow! Love your video and love the rose. I would use it to emboss doilies and use as backgrounds I think, maybe on foil colored with alcohol ink, similar to cuttlebug emboss folers. TFS!! and inspiring and the chance to win! That is GORGEOUS! I can think of so many ways to use this product. I would love to emboss and cut some SNOWFLAKES and use them for home decor! Love your card!! That rose is beautiful!! I would make embossed peices to put on frames or just use as wall hangings. I love the look of embossed metal, it reminds of times long ago when people took pride in their artwork. Love it! I love the ability to dry emboss, of course! I would use it in all sorts of ways, I would love to add cute and detailed cutouts to my mini albums! Thanks for the generous giveaway! Thank you for this video - I've never seen this product in action before. That rose is beautiful and I can think of lots of cards I'd like to make with this kit! Emma, the rose is beautiful. I think the Cri-Kits Embosser is wonderful. It would add so much to cards. Love the rose! What an awesome giveaway. I would use it to add dimension to cards and layouts. Thanks for sharing your project. I love the rose!!!! Butterfly's & some many other cute things to make with this. Thanks for the chance. Emma, Wow this is awesome! Love the roses! Thank you so much for showing us how these work. I have been wondering how... I have done quite a bit with stylus/brass stencils in the past! This is a great alternative! Thank you for the chance to win some supplies for using the products! oh how cool!!! I love how much the embossed image stands out on your card! I think I would use the embosser to make things "pop" on my cards or layouts!! Thanks!! Wow! That project is awesome! Would love to make holiday cards with it. This looks totally awesome! I would love to make cards and even home decor items with this! I didn't get to see your entire video, it stopped in the middle and wouldn't start up again-I'll be back later and try again. I LOVE the rose on your card!! OH MY GOODNESS . . . what a wonderful embosser I love the rose you created - I can't believe that my cricut will be able to not only emboss but cut it out the embossed item also . . WOW . . . my mind is just spinning with all the possibilities for this embosser . . . it will be great for making embelishments for layouts, cards, picture frames, you could even make 3-D holiday ornaments . . . the possibilities are just endless!!!!! I love how the rose looks so dimensional! Wow! I think I would use it to emboss stuff for my tags on presents. ;) How beautiful would that be? I love the embossing! I would make cards if I had one. thnaks for another awesome giveaway! WOW that's a beautiful card...I would love to win a Crikit Embossing kit! It would add so much dimension to my products! Great giveaway! Emma thanks for the video, I really like how you can use the same housing unit for both the embosser and pens. I really can see myself using it for my scrap booking projects. thanks for a chance to win! Emma this is too stinkin cute. Love your tutorial on this new toy. Thanks for an opportunity to win! An early b-day present would be awesome lol. Wow! That rose is beeeeautiful! I would like the embossing kit to make cards. Thanks for the opportunity to win. Wow another great tool for the Cricut!! Love it. I wool love to win so that I could make some really neat Christmas cards with it. Love it!! Come on over and visit thebusybug.blogspot.com! OMG! I just got a birthday card from my sister-in-law and it had all this embossing on it. I was looking it over to see how it was made. It was just beautiful and I would love to win that kit. I just love their pens so this embossing system is AWESOME.... I can't wait to make Mickey background all together!! So awesome! I think this would make beautiful Christmas cards.... for starters! So many possibilities. Your project was beautiful as always Emma. Thanks for inspiring me everyday. I would love to win this I'm sure I could find loads of things to make with it. Thanks again. This is super cute and I can't wait to get one for myself. Love Love Love the foil sheets and all the incredible colors they come in. I love your rose, it is my favorite flower as well. The Cri-Kits embossing kit is on my "want" list and I can think of all sorts of things to make with christmas coming. Stars with the silver and trees with the green and maybe wreaths. It would be so much fun. A Santa would be cute too. So beautiful! I have been working with metal sheets to cut dates to place on hunting mounts for a group of guys in our cabin. I've been hand embossing these little 3/4" numbers. This looks so much easier (and much less time consuming) but I have already invested in the material. I doubt I can talk my husband into making another purchase. I've got my fingers crossed to win!!! TFS! Wow!!! Awesome!!! I LOVE embossing paper!!! I wonder if it does that too? Anything that provides texture is a fave. Love the card. ps. I think your card looks beautiful. I agree with you, you didnt need much because the rose is the main attraction. Wow, an embossed rose. So nice. I think that is an awesome tool. One every cricuter could use. I love the texture it adds. I would love to use in on borders and frames and all kinds of things. Cool kit:) I would make tons of things with this, there are so many pretty colors:) Love the rose, so pretty! Your rose is outstanding (as is your card)!!! I would so love to win the Crikits' Embossing Kit! I would use it to make my Christmas cards...I love the way the letters/sayings look embossed on the metal. You're rose is so cool! What I like about the Cri-Kit Embossing kit, is that you won't be buying any more emvbossing folders and that you can emboss on so many different things. If I won this kit, I would begin to use it right away for my Thanksgiving and Christmas Cards. Emma as usual you created a lovely project. The Crikit set looks great. Thank you for sharing! I have embossed before with a different item but I would love to win the Crikits Embossing Kit! I love this embossing kit! Wow! I would be embossing everything!! Love it!! would love to win this!!! i would start off with making my xmas cards. then the possibilities are endless. thanks for the chance to win. I have tried the Cri-kit pens, after I seen you and Christine using them, and now I want the embossing tools also. I can just see all the wonderful Christmas, Easter and Birthday cards using these. I would love to win this kit because I've never worked with the metal sheets before and each and every project that I've seen using these sheets, especially this rose, is FANTASTIC!! Love it, love it, love it! My Christmas cards would GLOW using this kit! What a great product! I love embossing of any kind and this would take my cards and pages to a whole new level of embossing!! I would love to use it to emboss some cuts from B is for Boy for my grandson's pages...this kit would help make just the right masculine touch to them and I will be getting the Shall We Dance cartridge in the next few days....I can see cute little dance shoes embossed for my granddaughter's tap class photos. Beautiful rose! I enjoy making my own embellishment so I would love to use this to emboss embellishments to use on LO's and cards. Thank you for the chance to win! The rose you did was so pretty. I am new to the cricut world but just love it.My friend and I have started scrapbooking at our church on friday nights so we are all learning together. There is only 4 of us right now but hope to get more.I would really love to win this embosser that way we could all use it, with times being so tough right now it helps to get together with friends to forget about the bad times for a while.Thank you for the chance to win the embosser kit. What a cool product. I would use this mostly for making cards I think. This is the first time I have seen this type of embossing kit and I love it. This is also my first time leaving a comment. I guess its a morning of firsts for me. I would definatley make christmas cards for all my family with it. I would love to win one of the set. I would use it to make my nieces wedding invitations. Wow would definitely like to have this. I could add it to my sports layouts and really make things pop. I LOVE this card! It is adorable! I would use the embossing kit for elegant cards. WOW, that's really cool! I think I'd be all over that for my Christmas cards and my daughters birthday invites!!! If my projects would look as good as yours, then I know I would love it. What would I make with it, well everything, of course. Beautiful card and I love the rose. I would try using it for card making! Thanks for the chance to win. Wow!!! I had never heard of this before for the cricut!!! Your rose is beautiful!! I can see so many beautiful cards and scrap book pages with this. Thanks for the video and another chance to win a product!! Very Cool! I think this would be cute with a Christmas tree for Christmas cards. I love this tool! I was going to buy the embosser and found I had to have the mat too which was too expensive for me at the time. So I'd love to have this kit, I'd love to try embossing on vellum as well as metal. I can just see a stained glass window effect with the vellum, then use markers on the underside to create the stained glass effect! Thanks, Emma, for the chance to win! oh my what don't I like and what wouldn't I use this for?!?!? I love embossing and had not heard of this! I would love to win one. Oh - I love this, love this, LOVE THIS!! Your rose looks fabulous and am am SO impressed with this product!! I would LOVE to use this to make a nativity scene. The images would look amazing with that metallic paper and embossed lines. Thank you SO much for this opportunity and the video. If I win, I'll know exactly how to use the product already!! PS I'm so glad you switched the blade. I was wondering about that as I was watching! Oh wow..is this exciting or what? It is like a dream come true! What would I make with it? Cards, cards and more cards....and if I'm really lucky....Christmas cards. Thanks so much for the opportunity...its fantastic! I would use it in my card making.......for all sorts of things! Wow, very pretty! I would probably do some nice christmas embossing since I'm planning on making gifts this year. Thanks for the oppurtunity! I would use it for embossing, this is amazing thanks for a chance to win Emma! Oh the possiblities are endless, I would LOVE this product. I would try to do a few flowers,pumpkins,etc. Just like you did. But mostly I think I would use it to emboss different lable shapes and stamp sentiments inside them.....I really like the way that looks. Oh my goodness I would love one of these. I would do snowflakes now and Christmas trees. Thanks for showing how to use this awesome product. Oh my goodness, this is awesome. My sister is a card maker and I would love to give this to her for a Christmas gift. Cool!!!! Have never really seen this before, so thanks for the demo! The rose is beautiful and looks perfect on the card. I really like how you were able to get such a deep embossed look to the rose. I know I would use this for cards, but I'm sure I can think of other craft projects to use this on, like maybe altering something and attaching whatever I embossed & cut out & then using some distressing inks...uh oh....my mind is spinning now! This looks like so much fun!!!! i would love to win this, it would add so muchto a project.....Thanks for the chance to win!!!!! I have been checking out an embossing kit! I think it would be So fun to play with! awe.... someday! Love, love, love it!!! I put foil tags on my masculine or vintage cards and this would be perfect especially since I get to use my Cricut. Emma thanks for showing this tutorial I had not seen this product before so I will definately visit Cri-Kits. I love this, I would use this in books for children, for dimension, so they could fell the different textures. I would use it alot in my home decor items. I think it would add so much dimension to all my projects. would love to win this, Im thinking xmas trees and xmas ornaments....love the embossing. VERY NICE!!! really like how you showcased this rose; it came out looking so beautiful! I would emboss paper with the many different lacy cuts that a lot of the catridges have. Great rose, I love to emboss and this would be a great addition to my collection of folders. I love that rose and how it turned out! wow that is really cool. I think I would use it to make a few cute card. This looks really easy to use. This is an awesome tool Emma! I would love to win one of these. I think I would love it for flowers and trees. I really would love to try these out - They are WAY COOL... Thanks for the great video!! I think it would be great to emboss all kinds of images, but I would make a butterfly (cuz that's the first thing that popped into my head!). Thanks for the awesome opportunity!! I love your Rose Card. I do more scrapbook pages than cards, so I would love to win the Embosser Kit to see how many pages I could add metal and vellum accents to. Thanks for the chance to win.